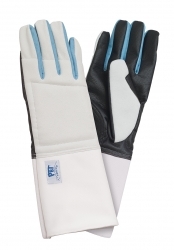 Comfortable cuff glove with upper hand padding. Comfort & control with style and easy opening velcro cuff. 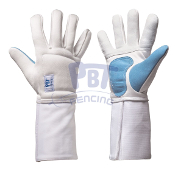 Strong velcro cuff glove with padding and a textured palm grip. New innovation with great grip! Replaces our Sticky glove. Very strong, durable, rubberized material on the inside of the fingers and palm area. Suitable for epee & foil fencers. Made of possibly the thinnest 800N fabric on the palm and thumb and slightly thicker 800N fabric on the back of the hand and between the fingers. No seams between the fingers help reduce penetration risk. Includes artifical leather inside the fingers, thumb and on the palm for better grip. Anti slip and reinforcing patches on the essential and critical parts. (thumb,forefinger and palm) with contrasting colour combination. 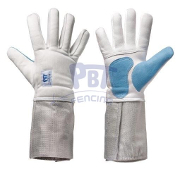 The safest PBT Sabre glove designed to prevent hand injuries caused by stiff broken or non broken sabre blades. Aims to deliver perfect protection, fit and grip according to the FIE guidelines. Made of possibly the thinnest 800N fabric on the palm and thumb and slightly thicker 800N fabric on the back of the hand and between the fingers. Soft but resilient wahsable material. Soft but resilient non washable material. Available in small or large please note different code for each size.